ToursByLocals Blog - ToursByLocals Celebrates 500,000 travelers! This month, ToursByLocals hit a big milestone: as of October 2 2016, 500,000 travelers have now taken tours with our amazing local guides! Since we launched our site in November 2008, half a million travellers have walked through our virtual doors to book tours with our guides in over 145 countries. To celebrate, we identified the 500,000th travellers and surprised them with a phone call while they were on tour with our guide Steeve in Quebec City, Canada. Heidi and Larry Canarelli from Nevada were at the start of a 10-day cruise of the Maritimes and Eastern Seaboard. In addition to the tour in Quebec City, they had booked shore excursions with our guides in Montreal, Halifax, Saint John, Boston and New York City. We had a bit of fun with Heidi and Larry, and their travelling companions, Chet and Carla. After the surprise phone call, we treated them and their guide to lunch at a classic Quebecois restaurant. As their cruise progressed, guides along the way presented them with little tokens – from wine and maple syrup to a commemorative book. 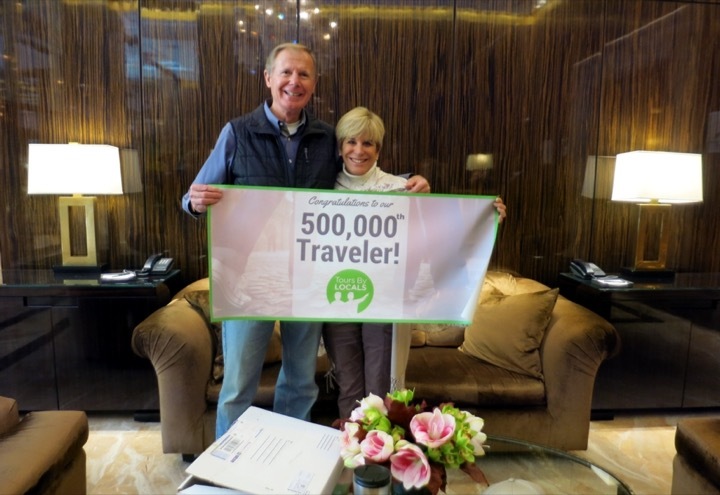 Finally, when they reached New York, their final guide, Matthew, presented the 500,000th travellers with a $500 gift certificate to use on future ToursByLocals tours. We thank the Canarellis, and every single one of the other 499,999 travelers who have decided to spend time with a local guide on their travels, and relied upon ToursByLocals to find the right one.